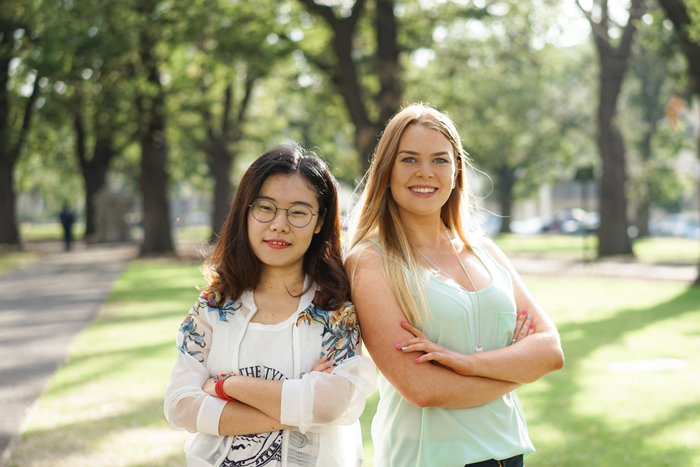 Bachelor of Commerce students, Yan Liu and Emma Swannie recently completed internships over summer, the latter in Melbourne, and Liu in Shanghai. They share what it was like to get a taste of the working world. As summer rolled in over December 2016, Emma Swannie was enjoying a welcome breakfast in EY's Melbourne offices, while Yan Liu was making her way across Shanghai’s financial district of Lujiazu. Both of these young women were just about to take their first steps into their summer internships: Swannie with EY, and Liu with Zhongyin Financial Leasing Co. Ltd. (Zhongyin). 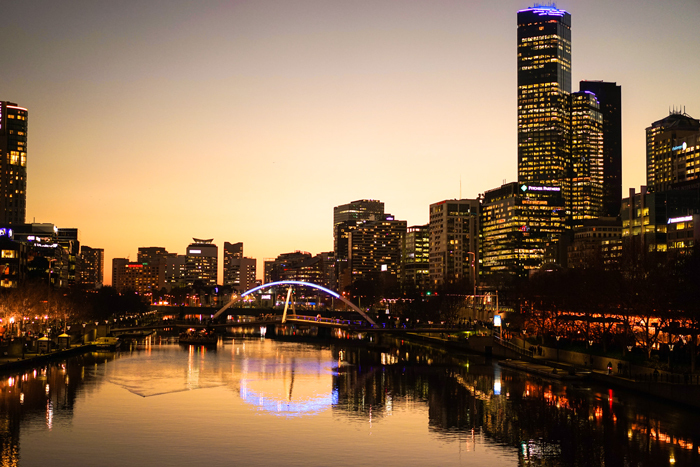 Melbourne at dusk, with its CBD on the right of the Yarra River, and Southbank on its left. Swannie participated in an induction program that was (unsurprisingly) efficiently timetabled and thorough, yet also enjoyable. Recalling her first impressions at EY, she said, “On top of the regular presentations and learning modules, we were also sent on a scavenger hunt!” The timing of her internship also meant that she was part of EY’s annual ball in December and the Winter Wonderland event at Crown was a highlight and a memorable way to end her two weeks of training. As Liu set foot in Lujiazui, located on the eastern banks of the Huangpu River in Shanhai, she felt dwarfed by the skyscrapers that house some of China’s more influential financial organisations. “The busy streets and the sight of all the men and women in their corporate suits on their way to work both excited and overwhelmed me,” recalled Liu. 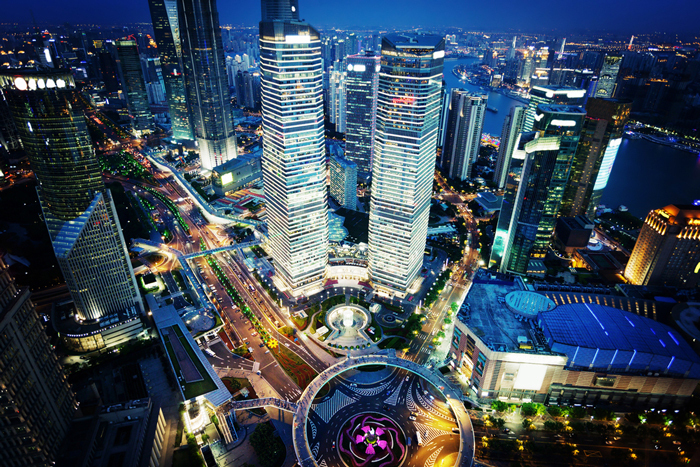 An aerial view of Liujiazui, Shanghai's financial district. In the new year, Swannie was ready to take her seat amongst her EY colleagues, and in no time at all, also found herself part of the team’s customary Friday lunch outings. “After the training and feeling so welcomed by the people around me, I felt ready to tackle the real client work that was to come,” she said. Swannie was placed in one of EY’s Assurance teams, and after a month of in-company work for her team’s first client, she was ready to head out to a second client’s offices. “To my surprise, the work I was assigned to do was important and necessary to the team! I was able to work with people from all levels of the business from graduates through to partners,” said Swannie of her off-site experience. "During my internship, I had the opportunity to work closely with two large Australian businesses, and it was fascinating to see the ways in which they operated. I also learned that it is entirely possible to maintain a work-life balance, and an internship is a wonderful way to gain insight into an organisation’s culture. “Even though my first impressions of Shanghai was that of an incredibly busy, high-pressured city, Zhongyin surprised me with their much more relaxed atmosphere. Although expectations were high, the general vibe was very friendly and welcoming. Jeans and sneakers featured heavily in the office, and my colleagues were always keen for stories from Melbourne, which I shared over lunch. As an intern, I was well-looked after, and never needed to work overtime. I really appreciated learning from the experience, and also enjoyed working and living in Shanghai. The winding Huangpu River, flanked on one side by The Bund, featuring stunning, historical buildings, and by modern skyscrapers of Lujiazui on the opposite shore is to me, a must-visit in Shanghai. This larger-than-life display of architecture reveals an amazing comparison between the country's modern history (colonial past and western influence) and its contemporary society (representative of China’s role in the global economy), and is a unique symbol of Shanghai! This internship has truly been an eye-opening experience for me." We would also like to congratulate Emma Swannie, who has just been offered a graduate role at EY, beginning in 2018! Well done, Emma! Bachelor of Commerce Students can find out about upcoming internship opportunities through their weekly current student Newsletter or via Melbourne Careers Online.